Frozen: Ice Hotels in Canada and the World! At this time of year, with looming snowstorms and ice beginning to build on our driveways – sun destinations, like the Caribbean, and Florida – seem to fill our thoughts to escape the cold and dreary days. We thought it would be good to pay homage to the season and give you a taste of some of the latest and greatest ice hotels in the world including the world’s first permanent ice hotel in Sweden that will remain open all-your round! The new Icehotel 365 at Jukkasjärvi in Swedish Lapland is “a year-round ice experience,” with 20 suites, an ice bar that serves champagne and drinks, as well as an ice gallery – all created out of snow and ice by select artists from around the globe. 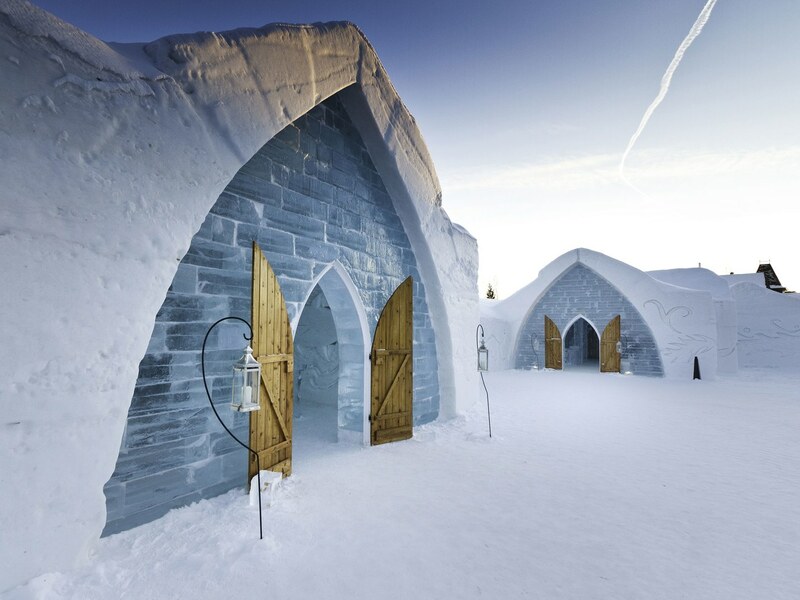 Here is a taste of some of the world’s best ice hotels, including our very own Hotel de Glace – right here in Quebec City, Canada. Read: One of Canada’s Wonders – Niagara Falls Frozen. Since opening in 2001 the hotel has had over a million people around the world. While temperatures in the 44 rooms or suites linger at around 25 degrees Fahrenheit, the bed frames (also made of ice) come with blankets and arctic sleeping bags. Higher-end suites have in-room fireplaces for the cold-weather weary. From January 4 until March 26, 2017 enter this magical universe by visiting or lodging in this ephemeral work of art. After 27 years of being built and rebuilt each winter, northern Sweden’s ICEHOTEL 365 will be the first frozen accommodation in the world to stay open year-round. New solar-powered cooling technology will allow part of the legendary hotel, including a bar, art gallery and 10 luxury suites, to host guests in search of midnight sun as well as the northern lights. Located 200 kilometers north of the Arctic circle in Jukkasjärvi, ICEHOTEL has been built to a fresh blueprint each year, using 5,000 tons of ice taken from the nearby River Torne in the spring and cold-stored over the summer. Since 1996, the SnowCastle in Kemi, Finland has offered guests a unique seasonal experience in the world’s largest snow fort. Snow sculptures and light effects create an enchanting ambiance throughout the hotel, which also includes a restaurant and chapel. The Hotel of Ice, Romania’s newest hotel is (re)built every year using four-feet long ‘bricks’ made from ice from the nearby Balea Lake. Every year this unique hotel features a new design. All rooms have ice beds with comfortable mattress, covered with bed-sheets and soft furs. Guests will also be provided with a sleeping bag for the night. Meals (breakfast, lunch or dinner) are served on ice tables, guests sit on ice chairs and most cold dishes are served on (even colder) ice plates. This is the real deal! !